"819 R.R. 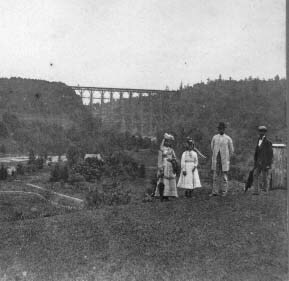 Bridge from Glen Iris Park"
Although the title and the framing indicates that the wooden Portage Bridge is important in this image, so are the people who are posing before it. Although their identities are unknown, they represent the thousands who came in their "Sunday Best"to visit Mr. Letchworth's Glen Iris "Park". For more information also see the Glimpse of the Glen Iris.